I would describe Kings of Georgian England as an introductory text. 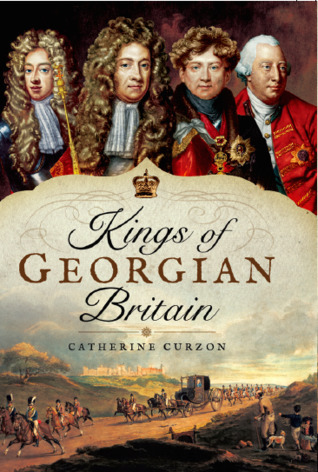 In the small page count, there is only a limited amount of space in which Curzon can describe each of the four kings' personalities and reigns, but she manages to include some fun facts and enticing details, all written in a readable, straightforward prose that never feels too stodgy. For me, this is a great book to turn to if you are relatively unfamiliar with the period and looking for a quick overview. This work won't tell you everything, but it provides a good place to start and includes an extensive bibliography for further reading. The Georgian era is one I love, so most of the information in Kings of Georgian England was familiar to me. However, there were a few little side stories I'd not come across before, and the book certainly reigniting my enthusiasm for further reading about the period. If you are a scholar of the 18th century, this book may not have much to offer. Nonetheless, I am awarding it four stars because it is perfect for the novice historian coming to era for the first time.